parses out cold stars along a tracery of oak. Beneath the rising moon, fine participles gleam. evocative declensions of a season now unbound. Split by ice, the pond breathes smoke. Split by cold, the blackened ferns release their shattered fronds. Split by hoarfrost, fences bend and crack across the cold-boned land. then punctuate the dim and drifting hills. Previously published, this poem has been slightly revised. Comments always are welcome. Given the absence of snow in coastal Texas, photographer Stephen Gingold graciously allowed use of his photo. Click here to visit his site. Bravo, Linda. I looked up declension but am unsure how to see it clearly with evocative. I am a mere student grammarian which might explain it. The poem is beautiful The photo could have been taken in Finland. ‘Winter in America’ is a great song. “Winter in America” and Doug Ashdown are new to me, but you’re right that it’s a great song. I smiled when I saw he’s Australian, and then I smiled again when I saw that his song had risen fairly high on the Dutch singles chart. Lots of connections there. I do wish those who taught me to diagram sentences still were alive. I think they’d enjoy the poem. I’m certainly glad you did. Winter in America was originally written by Jimmy Steward, an Irishman who lived near us in Sydney. He used to be my partner when we were in a vegetable co-op. He used to work on the lyrics while we were having breakfast at the markets at 6am..
Well, good morning to you, Pit. I’d wondered when your trip was scheduled; now I know. I presume you’ve found some of that good bread you were looking forward to. I’m glad you enjoyed the poem. Give my regards to Mary, and enjoy the rest of your trip. Safe travels! That’s great to hear. Have one (or a dozen) for me — especially those sweet rolls. The picture and the poem have me thinking of the hidden beauty of winter, even the frigid wind that freezes my soul this morning here in central Ohio. Sometimes the beauty can seem a little too hidden. Remind me of frozen locks, ice-covered streets, and power outages, and every bit of winter-romanticism drains away. Still, there is real beauty in the starkness of the season. It’s the reason we warm-weather dwellers who’ve known ‘real’ winter often long to experience it again. You entered the photo and emerged with words so descriptive, they take us with you. What a lovely comment, GP. I’d never move back to the north, but I do enjoy visiting from time to time: even if only in imagination. To have cleverly split “Infinitives” from the three sentences beginning with “Split” is indicative of good design. If I count aright, this is the third “conjugation” of your poem. I’m glad to see that this time you illustrated it with a photograph by S.G. I so enjoy Steve’s winter photos, and have been waiting for the right time to post this. Given the current forecast for a good portion of the country, it seemed appropriate. You probably noticed that the substitution of ‘infinitives’ was one of the changes I made. How I could have missed something so obvious, I’m not sure, but now it feels right. Ooooo, gorgeous photograph and lovely wordplay poem. I am infinitely split over which I like better…. And how cleverly you continued the wordplay! 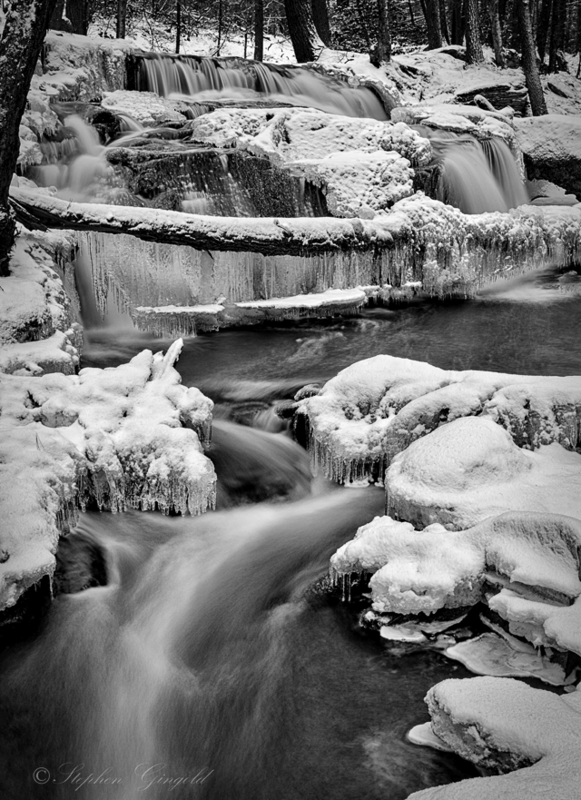 Steve’s photos always are wonderful, but his winter snow-and-ice photos are especially evocative. Now that I think of it, his water-and-fog images probably would please you, too. oooo I will look, since I love water photos…. I attended the school of the Reverend Maclean. He taught nothing but reading and writing. And being a Scot… believed that the art of writing lay in thrift. “Half as long.” his father says. So while my friends spent their days at Missoula Elementary… I stayed home and learned to write the American language. Exactly. I’ve always thought the best answer to the question, “How many words should a story (poem, essay, blog post) be?” is “Just as many as it takes: no more, no fewer.” Emily Dickinson and Marcel Proust nicely represent both ends of that particular spectrum. The rest of us just try to figure it out. A very nice coming together of works by two bloggers I admire. Thank you, Jim. Collaboration can be fun, and it’s especially nice to be able to highlight the work of someone I know when I can’t produce an appropriate image myself. You are both very good at your specialities. Ohmygod, your lovely poem and the photo took me back to a day I went snowshoeing out in the woods where the only sounds we heard were our own breathe and that of Mother Nature’s. Isn’t the silence of a snowfall wonderful? Whether it’s still falling, or simply has blanketed the world, there’s nothing better. Fog has some of the same qualities, but it isn’t the same. On the other hand, I smiled to read your comment about the ‘crackerjack crunch’ of snow in very cold weather. That’s different, but also singular. I’m convinced that once it’s heard, it’s never forgotten. Such a lovely comment, and in a perfect, poetic form. Whatever form we choose, arranging (and rearranging) words is truly a joy. Now *this* is a poem, Linda!! It evokes memories of diagramming sentences as a child (kids don’t do that anymore, more’s the pity). Your word choice and the images brought to mind would be stunning even without the gorgeous photo — though who doesn’t love a waterfall, frozen or not?! Thank you for such a special treat on my Sunday! Gertrude Stein once said there was nothing she enjoyed more than diagramming sentences. That may have been hyperbole on her part, but she knew a thing or two about sentences. I always enjoyed the exercise, and was surprised to read this article — although I suppose I shouldn’t have been. Most interesting article! I’m in the LOVED diagramming camp, although that’s probably not a popular stance these days. My English teachers tended to be very old-fashioned — book reports, spelling words correctly, punctuation, etc. — and I can’t sing their praises loud enough. How much time I save by not having to look up everything! Stunning photo to accompany a terrific and clever poem. The images are sharp like winter. Hmmmmmm…..you’ve used a noun to modify a noun. Who can find this? I’ve been looking for the noun-modifying-a-noun and still am unsure what you spotted. I have, however, learned something about ascriptive nouns. But, since one good question deserves another, can you spot the one-word title of another winter poem? I didn’t notice it until very recently, and then I grinned, because it’s among my favorites. It may have sneaked in from my subconscious. Ah… right. As for the poem, you’re close. I was thinking of “Spellbound” by Emily Brontë. I shall endeavor to read Spellbound as soon as I move back into my kitchen…. It’s short — you could manage it now, I know. Are you getting close to setting things to rights again? I do hope so! Just shows to go you that my short stint as Aardvark on Grammar Girl’s website was not in vain. I use that site from time to time. I keep coming up with odd questions and almost always can find the answer I need, quickly and with enough clarity to keep from confusing me. Sometimes, I just get more confused, and re-write my sentence. What an elegant appraisal of winter’s grammar. Thank you, Jeannette. Winter’s far more than slush, traffic accidents, and layers of clothing. I like remembering that from time to time. The photo and words evoke the stark beauty of winter, but I am grateful to experience it only virtually on this cold but sunny Texas Sunday. I don’t know. If we could get a nice snow to go with the cold, I’d be willing to sign on. I’d only want a civilized snow, though, like we had on Christmas eve some years ago. There was enough for some gorgeous photos, some snowmen on the beach, and a lot of 60 year old kids having the time of their lives — and then it melted. It was the best of all worlds. I like the imagery of that last stanza. A departure in style for an author more well known for the etheree. Sometimes I surprise myself. I didn’t set out to “do something different.” It just happened. Granted, there was some fiddling with things along the way, but to paraphrase one of our old friends, there’s nothing half so much fun as just messing around with words. Beautiful poem, matched in quality with the photo. The third stanza was especially evocative: I could hear it, see it, feel it,touch it. All that a poem should be. I’m so pleased you feel that way, Tina. I’m quite fond of that third stanza myself. I thought that if it evoked a strong response in me, it might do the same for readers, and you’ve just said that’s so. That really is terrific. Thank you. I just went out to see how the eclipse was progressing, and it’s right on schedule. I’m going to try to stay up for totality, but it’s getting iffier. Frozen water of all sorts is beautiful. Even when it’s nothing more than the skim on a birdbath, it can be fascinating. If we’re lucky this year, we might at least get a good freeze and some frostweed ice, but we missed on this one. Tomorrow, it’s warming again. I hauled everyone out – Molly refused to howl…and towards the end started mentioning her sitting was getting cold. But it was such a sight. The coloring seemed to give the moon more round/ball shaping rather than the usual round disc. Eric Berger’s saying that he gives us a 30-50% chance of some flurries before the end of January, but nothing this week, except for those well north of the city. We’ll see. I don’t care how cold it gets, as long as it stays dry. Well, that’s not true. I would prefer seventy and sunny, but I don’t get to set the thermostat! I enjoyed your poem and Stephen’s photo. A good combination, Linda. I once combined a haiku with one of Steve’s photos of a summer water lily. It occurs to me that spring and autumn pairings would be nice, too. I’m glad it pleased you. You made the cold icy weather seem romantic. Super poem. Maybe it’s all those repeat watchings of David Lean’s Dr. Zhivago bearing fruit. Of course, I only remember the lovely winter scenes; selective memory can be a fine thing. Thanks for the kind words — I appreciate them. Now, that’s not so romantic. Memorable, yes; romantic, no. Very beautiful, poem and picture! Thanks, Terry. Some day I’ll get to experience your kind of winter again — at least, I hope so. I love the idea of nature being a ‘grammarian’. Beautiful poem, and Stephen Gingold is such a great photographer. I like his landscapes, and b&w is not easy. He did a great job. I’ve learned a good bit about photography from both Steves, as I have from you. Classes and reference books are fine, but being able to hear from the photographers themselves how they did ‘this’ or ‘that’ is so helpful. Classes and such can provide a torrent of information, but a steady dripdripdrip of information can wear away ignorance, too. I’ve always enjoyed SG’s winter photos, and was pleased to find a way to present one. Thank you for praising my photography Linda. I really enjoy yours also. When I agreed that you share my photograph with your writing, I felt it would be elevated and I was right. I appreciate that you tied them together, Linda. I wish I could put those beautiful words with my images but am glad that you thought to do so. And…I learned a new word…scry. There is a lot to enjoy about winter, but I have to admit that the recent temperatures plus seeing photographs of flowers and bushes in Texas do make me think other climes might be nice too. Infinitives abound… that was fabulous! Thanks, Dana. I don’t know why it took me so long to find that word, but at least I found it. I’m glad you enjoyed it! Lovely poem. I enjoyed the splits leading to infinitives. As for passive voice, interesting to read that today, while our windchill here is -13. When I walked out this AM, that chill seemed pretty active to me, particularly in the area of my sinuses! Now you have me wondering why I didn’t choose active rather than passive voice. I really don’t know — it just seemed right. In some ways, it’s as mysterious as why it took me several years and three revisions to come up with ‘infinities.’ I’ve been enjoying the birds coming to the feeders at the Cornell site in Ithaca. Watching the birds trying to dig through inches of snow piled on the seed platforms reminds me of what it was like to plow through those deep wintertime drifts while trying to ward off the chill. Fine poem, and great to see one of Steve’s photographs. It’s finally *cold* here (single digits two mornings in a row), I’ve been out early enjoying the ice. It’s always a pleasure to feature a photograph from one of my ‘favorites.’ The first time I did so, I used a photo of a pelican taken by Floridian Judy Lovell to illustrate a bit of a rant about the Deepwater Horizon oil well explosion. Her bird photography is so appealing, and a real inspiration. I keep reminding myself that you and your cohorts in the frozen northeast have much better protection against that kind of cold than I do. I can be comfortable working in 40F weather, and can be out in freezing weather, but below that? I’m afraid you’ll find me indoors. Enjoy your ice! Thanks for the link to Judy Lovell – so many flamingos! I had a couple of days of single-digit cold, and got out early to hunt for crystals. Now it’s back up to 40F. Funny you should say that. I may have mentioned that I keep a casual eye on the bird feeder cam at the Cornell site in Ithaca, NY. For several days it’s been around 7F. Tonight when I looked, it was 39F, and the snow covering the seed had melted. I suspect there will be some happy birds in the morning. I had so much fun with this poem! I adore grammar (and though diagramming was largely gone by my schooldays, I still learned it from my mom and did tons of it in linguistics grad school). My favorite image is of the dangling participle leaves; even before you used the word ‘dangling’ (which, oddly, I did not even register until I went back and read more slowly), I was picturing those participles swinging from bare boughs! I had a good bit of fun with this poem, too. Figuring out ways to turn dangling participles and split infinitives into verse was a challenge that took some time to meet. As for diagramming sentences, did you happen to come across Slate’s challenge to diagram one of our president’s sentences? Here’s one response that delighted me no end. I wouldn’t have taken the time to try it, but the fact that someone did fascinates me. We do have a bit of wintery weather this morning, don’t we? We won’t have to shovel it, and we won’t slip on it, but it certainly is one of those days that makes August seem very far away. I like that line about winter unbound, too. I like to imagine Nature giving winter leave to do as it will: to go out and play, or to do its worst. Or both! I’m glad you enjoyed the poem, and I was so pleased to have such a fine photograph to pair it with. Brilliant poem. I love those last two lines especially. Thanks, Jason. It’s interesting to see how different people are struck by different lines. Those last two have quite a history; I’ve been working and reworking them for years, trying to decide where they belonged. I was glad to find them a home. Why am I so late to this. I think I’ve missed a few of yours and now will go back to see. Wonder if the notifications stopped for awhile or if life just got insane. Either way… I smiled at the Infinitives! And I’ll tell you, “winter unbound” is so spot on. It may just be that your attention span is iced over and your poor brain is frozen. When I looked at your weather just now, I shivered — never mind the snow. It’s those temperatures that are headed your way that got to me. Your winter truly is ‘unbound’ — I think it’s time for a little of that hygge that you’ve written about! I’m so pleased that you like it, Dina. I don’t think we ever lose a sense of the environment in which we grew up as children, as I certainly was immersed in just this sort of winter for many years. There are so many different kinds of snow, and so many sounds associated with it — it’s just fun to remember it all, and I was really happy to pull a few of those happy memories into the poem. Though I loved diagramming sentences in school, I am not enough of a grammar lover to thoroughly appreciate how you have woven that theme throughout… though I did think as I read about how winter might be speaking in the passive voice… and it seemed that the images you evoked were of natural things being done to by the fierce weather. There’s an interesting philosophical question: can drama exist in temperate climes? I suppose the answer is ‘yes,’ but on the other hand, I remember life in the Bay Area, and the times when I longed for a thunderstorm to break the monotony of all those perfect days, with their blue skies and moderate temperatures. I agree that the poem is about much more than the cold. That’s what I hoped to communicate, and that’s what you intuited, and that makes me happy. The Ritter books sounds fascinating. It reminds me of other accounts of life in harsh environments: particularly the journals of prairie women in the 1800s. I suspect not only the weather but also the isolation, the sense of vertigo induced by the limitless horizon, and so on were akin to what Ritter experienced. The storm-sailing I’ve done may be the closest I’ll ever come to such an experience, but there’s no question that being offshore — or even in a bay — in severe weather is both nerve-wracking and exhilarating. Many people experience the same emotions when a hurricane is approaching. No one wants that storm, of course. On the other hand? There is a certain excitement to it all. Thanks for this! “… conjugates brief slants of light… ” is especially rich, perhaps even allowing us to “hear” light’s shifts. Lots of conjugating going on these days in our part of the world!! Your comment about hearing light shift brought to mind synesthesia: the capacity to ‘hear’ color or ‘taste’ sound. In turn, that brought to mind a verse from Psalm 34: the one that includes the phrase “taste and see that the Lord is good.” I had to double check it to be sure I was remembering it rightly, and I was. Now I’m wondering if the Psalmist experienced synesthesia, or knew people who did. Watching the snow pile up and seeing the temperatures drop in your part of the world increases my admiration for you hearty souls considerably. As a friend told me, the way to conjugate snow is: flurries, blizzard, buried! This poem captures winter weather perfectly. We’re in the middle of a deep freeze here. Indeed you are in a deep freeze. I’ve been keeping an eye on what’s going on up there, and I’m really hoping that all of the systems manage to hold together. Snow and cold aren’t so bad as ice, it seems: at least, when it comes to keeping the power on. Down here, a good ice storm can wreak havoc. I have a lot of good memories of winter, which is why I enjoyed writing the poem. I guess I’d rather write about it than live in it, but visiting it wouldn’t be too bad. Stay warm! Oh, that’s beautiful, Linda. I can feel the chill, which is quite a thing since it’s a pleasant 75F this afternoon. Between your rain and those lovely temperatures, I hope you’re enjoying some time in the garden — and I certainly hope winter’s chill stays in your imagination! Beautiful, Linda! We will appreciate spring when it arrives. We certainly will – although I suspect we’ll not appreciate it nearly so much as people in the upper midwest. I’ve not checked to see how far south that mess is going to dip, but I certainly hope if you get cold and snow, it’s standard-issue and not quite so extraordinary. Passive voice, participle, declensions–if only I had access to this poem years ago when I was invited to teach Latin in a school where even English grammar was considered unhelpful by the curriculum composers (almost said “imposers”). Not surprisingly, the students loved it when I included poetry in our discussions; they thought it was more real than grammar. But it was not long before they picked up the concepts. Later I heard it lead to a positive influence on their writing. I think a poem like this would be well accepted at the New Yorker and similar outlets. Others of your poems too. And your stories and reflections. I’m glad that I found Shoreacres! I suppose every era has its fashions in education, but during my schooling, memorizing poetry, diagramming sentences, and learning Latin were standard parts of the curriculum. It’s interesting to remember that such things weren’t meant only for so-called ‘advanced placement’ students. Watching our diminuitive, gray-haired Miss Wilcox pit her teaching skills against bored linebackers was pure entertainment. I’m certain The New Yorker wouldn’t be at all interested in my work, but I’m more than glad you think they might find it acceptable. If the magazine were the magazine of thirty years ago, I might consider a submission or two, but for now, I’m just happy to write for you — I’m glad you found me, too.